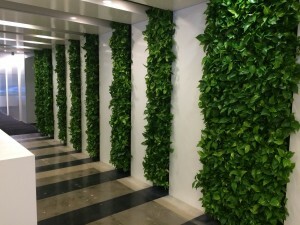 It is no secret that green walls are becoming a trend in today’s cityscapes. As buildings go up and our natural surroundings are diminished, the importance of designing buildings with natural elements increases. So much so, that things like the WELL Building Standard and LEED certification are becoming common references for developers as well as clients. Walls are popping up all over the world and so is design inspiration for your next wall. I will outline some of my favorite aspects that I have either personally seen or would like to use in future proje cts. Some clients would like congruency and choose to have the same plant species through the entire wall. This gives a clean look that generally will never change…unless the wall gets attacked by a pest or fungus. Some common species that I have seen used by themselves are neon pothos, jade pothos, golden pothos, lemon lime philodendron, philodendron mican, and philodendron brazil. This type of trailing plant is common for single species use due to the nature of how the plant grows. These varieties generally come in lush from most growers and will give your wall a finished look for the start. I say finished look as most systems you will be using are made of plastic trays that are fixed to the structure itself. These trays can be seen more or less, depending on the system you choose as well as the age of the wall. The longer the time your wall has to grow and thrive in its space the less of the actual housing you will see, in most applications you will see a 99% coverage rate, depending on light and care from a plant technician. There are many applications across the globe in which you will see a variety of plants used to create many different types of designs. This is where the design of your wall gets fun. It is important to know what type of look you will be going for from the start. The ability for you to account for the way your plants will grow over time can mean a healthy clean looking wall for years to come. Generally you want to limit your plant choices by the size of wall that you have. The bigger the wall, the more varieties you can use. 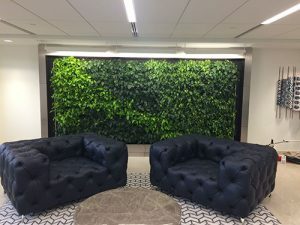 Make sure to get samples from your interior/exterior living green wall designer so you may see exactly what you will be getting in the long run. Designs can “pop” when you choose plants that contrast each other. 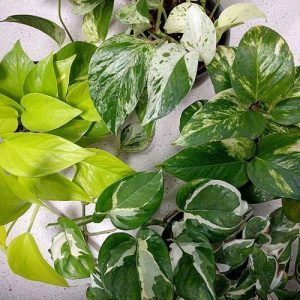 Interior plant choices that are great for this type of application are neon pothos, philo brazil, arbicola, marginata tips, bromeliad guzmania, bromeliad Neoregelia, ficus elastica, silver satin pothos. If you have an exterior living green wall you could choose from a variety of heuchera, many types of fern, some sedum varieties, jasmine, many ivy varieties, and much more. Outside walls can have more variety as they can generally take more sun and you can change plants seasonally to keep your wall fresh. Please speak with a foliage professional when making these decisions as you do not want to deal with a visual fiasco down the road. There are many other factors that can determine the health of your wall in the long run, but choosing the correct species for lighting as well as water needs is probably the most important decision you will make when looking past design aesthetic. Please remember to have fun with this and make your wall unique to your building! Oh yea….and call us at Foliage Design Systems of Atlanta when it’s time for your new living green wall project.